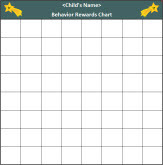 Use our FREE Behavior Chart template to document your child's good behavior. After printing the chart, place a sticker in each square when your child uses good manners, follows directions, picks up toys, etc. To add extra encouragement, offer a reward when the chart is full.